Materials Science and Engineering associate professor Paul Voyles and his team use cutting-edge microscopy techniques to develop potential engineering approaches for functional devices. The Voyles’ group couples experimental data from high-resolution scanning transmission electron microscopy (STEM) imaging with state-of-the-art computational methods to extract maximum information about the atomic-level structure of materials. The combination of experiments and modeling offers penetrating insight into key problems facing materials engineers synthesizing functional structures, including nanoelectronic, optoelectronic, and spintronic devices and catalysts. Working with Voyles, Andrew Yankovich recently discovered a variation in the thickness of the active region of a blue light-emitting diode that will guide efforts to achieve higher quantum efficiency (Journal abstract). LEDs are created by a microfabrication process called metal-organic chemical vapor deposition (MOCVD). This process deposits thin layers of gallium or indium, as well as other elements, to create the semiconductive properties that later lead to electroluminescence of the diode. Yankovich used focused ion beam to take a thin slice of a LED device to examine by STEM. One key to his ability to measure the thickness and polarity of the region was the comparison of experimental measurements to simulations of position averaged convergent beam electron diffraction (PACBED) patterns. This measurement allowed the Voyles team to confirm the presence of thickness variations by low-electron dose STEM. Andrew also joined a uniquely collaborative effort to characterize ZnO nanowires created in the laboratory of Xudong Wang by STEM. Wang had noticed unusual conductive properties in the nanowires, which were confirmed in the laboratory of Jack Ma. Yankovich then used STEM to elucidate the structural defect – called an antimony doped defect – that was believed to contribute to the material’s new conductive property. Andrew worked with computational physicist Dane Morgan to model different types of Sb-doped defects inside the ZnO nanowires with density functional theory (DFT) to understand their electrical properties, then compared those results again to the atomic-level STEM images to determine which of the possible defects were really present in the nanowires. Andrew’s work could lead to more stable conductive capabilities for nanoscale electronic and optoelectric devices. 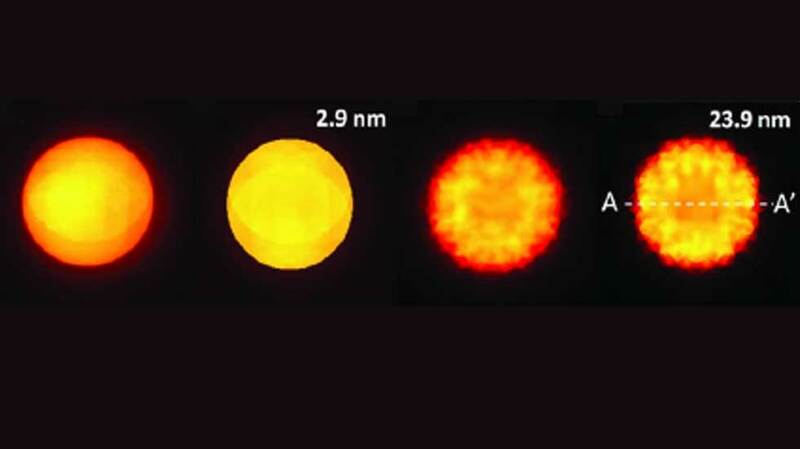 The Voyles group also uses a technique called “fluctuation electron microscopy” to study amorphous materials with potentially useful mechanical properties, like metallic glass. Many of metallic glass’s unique material advantages — such as its strength and resistance to corrosion and scratches – are not well understood at the atomic level. Research associate Li Hi is probing medium-range order (1-3 nm) metallic glass thin films at different temperatures to better understand these properties, and how processes, including crystallization, plastic deformation, electrical conduction, and diffusion take place. Her discoveries will guide future engineers to design new metallic glass alloys with desirable properties, such as high strength at low weight, good biocompatibility for medical implants, or very high magnetization. photo above: A key in the ability to measure the thickness and polarity of a region is to compare experimentally obtained measurements (left) and corresponding simulation (right) position averaged convergent beam electron diffraction (PACBED) patterns from two distinct areas of a thin sample of a blue light-emitting diode (LED). This measurement allowed the Voyles team to confirm the presence of thickness variations by low-electron dose STEM.